Relatively little is known about the family of the great astronomer. The Koperniks came from Silesia. In the older biographies of the scientist there are attempts to trace the origin of his name from a particular village – Koperniki near Otmuchów (German Köppernigk). However, this seems unlikely. The name "Copernicus", as well as the quoted name of a village, were created from the name of a profession functioning at that time in Silesia, namely kopernik, meaning a metallurgist who dealt with the mining and smelting of copper (Latin Cuprum, German Kupfer), or traded it. The name is recorded in Silesia in different cities (Wrocław, Ząbkowice, Zgorzelec, Oleśnica) and only in Nysa lived people who came from the nearby village of Koperniki, which was consistently reported by prefixing the names with the Latin "de" (i.e., from the village Koperniki). It cannot be ruled out that the name was formed in the present-day Slovakia, where were the largest copper deposits in the Middle Ages. The Koperniks appeared relatively early in Kraków. The first person of this name was recorded in the city in 1367, another one – armourer Nicolaus in 1375. From 1400 a rope-maker, Laurentius Kopernik also worked in Toruń,. This does not mean that those people were the astronomer’s relatives. They were only united by the name and the profession of the ancestors. There is no doubt that the name was of Slavic origin, with the "nik" ending, typical of the Polish language, added to the professional designations (łagiewnik (potter), miecznik (sword-bearer), stolnik (master of the pantry), (rzemieślnik (craftsman), etc.). Perhaps Nicolaus Copernicus’ great grandfather was also Nicolaus, a bricklayer, who was admitted to the municipal law in Kraków in 1396. His son may have been John, an active Kraków trader, quoted in the Kraków acts in the years 1422-1441. In 1434 he did business with wealthy Kraków merchants Jan Sweidniczer and Jan Teschner. It is worth mentioning that the sons of those two Kraków councilors moved to Toruń, and entered to the local patrician group. In 1438, Jan Kopernik waived his municipal right in Kraków and settled in the neighbouring Kleparz or Kazimierz. The already known to us Nicolaus Kopernik, son of Jan and father of the astronomer, was recorded as a merchant in the Kraków records in 1447. He traded copper as early as 1448, and delivered 38 hundredweights of the metal to Gdańsk, which was certified by an appropriate entry in the local council books. Copernicus’s commercial interests covered the area between Silesia and Kraków, and Gdańsk and Toruń. The young businessman could not miss Toruń, because the city had the staple right for all goods exported from Poland to Prussia from 1400. Kraków had already obtained the staple right for trade in goods imported to Poland from today's Slovakia from where Toruń imported copper. To alleviate that burden Toruń and Kraków merchants established trading companies. The greatest guarantee of success, however, gave movement of a merchant family member to one of the competing cities. The astronomer’s father must have enjoyed great confidence from his shareholders because in August 1454 he represented the Kraków merchants in settlements with Gdańsk. There are signs that he did not return to Kraków. In 1455 in Toruń a certain Coppernick was recorded without a first name. He was a lodger at a house at Szewska Street. There is no reason to doubt that it was Nicolaus Kopernik, the astronomer’s father. He probably then took the decision to stay in the wartime capital of Prussia. The war gave the opportunity for profit. 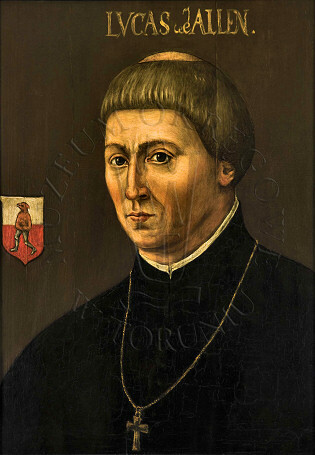 In 1458 Kopernik appeared already as a citizen of Toruń, so perhaps at that time he married Barbara Watzenrode who was about 20 years old at the time of marriage, whereas the groom was at least 35 years old. Nicolaus Copernicus’ mother’s family, Watzenrode, had been associated with Toruń significantly longer. The Watzenrodes came from Hesse from where they migrated to Silesia in the thirteenth century. 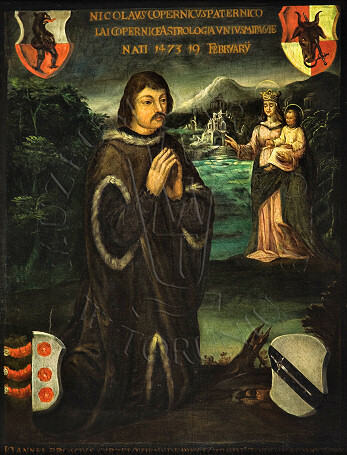 Earlier the Watzenrode family were derived from the Slavic family of knights and lords of Pszenna (German Weißelrode), but beyond a certain similarity of names, nothing linked any of the two families. The first mentions of the members of the family in Toruń come from 1369. It followed from the records in the oldest council book of the Old Town that three brothers lived then in Toruń: Fryderyk, Albrecht, and Jan Watzenrode. If they were first generation citizens of the city or if their father and perhaps grandfather lived there nothing is known. Nicolaus Copernicus’ father, although he came to Toruń during the war, continued the traditional lines of trade which, owing to changes in trade routes and the economic situation, began to bring less and less revenue. At the end of his life the merchant of Toruń fell into serious financial trouble, collected money from debtors, and finally, in 1480 he sold the house at St Ann Street (now Kopernika 15). Neither the native city nor his parents were able to give the youngest of their children any hope for a prosperous life in the future. His father died as early as 1483 leaving Nicolaus an orphan at only ten years old. Hope for a better future lay in the hands of distant relatives and, above all, his uncle - his mother's brother – Lucas Watzenrode who, thanks to the education he had obtained, quickly climbed the career ladder in the Church. Family ties in those days were very strong, and nepotism, namely promoting relatives in obtaining offices or revenues, was not only widespread, but almost mandatory. The future astronomer was one of Nicolaus Kopernik Senior’s and Barbara Watzenrode’s four children. Probably the oldest daughter was Catherina who married Bartholomeus Gertner who, like her father, came to Toruń from Kraków. Gertner was later a court juror in the Old City of Toruń. The Gertners lived in a house belonging to the Koperniks in the Old Market Place 36 and had at least 5 children: Catherina, married to Andreas Wachschlager (from him came a patrician family functioning in Toruń until the early nineteenth century), Christina, a nun at Chełmno, and then the wife of Casper Stulpawitz, a drummer from Konigsberg, Regina, the wife of Clemens Müller of Stargard Gdański, and two sons: Georgius and Albrecht. Further fate of the descendants of Catherina and Bartholomeus Gertner, outside the Wachschlager family, are not known. The astronomer’s other sister was Barbara, abbess of the convent at Chełmno (+ after 1517). Andreas (+ before 1518) was born a few years earlier than Nicolaus. He was Nicolaus’ companion on school trips, and also a canon of Warmia. His way to higher office in the Church was stopped by a disease, acquired while studying in Italy, perhaps syphilis, which caused his removal from involvement in the work of the chapter and enforced solitude in the last years of his life. Perhaps the astronomer had more siblings, but those children must have died in early childhood and their names were not recorded in the sources.